Incoming seniors can apply for a parking space by logging onto their Google Classroom account by Aug. 22 (Submitted/The Report). 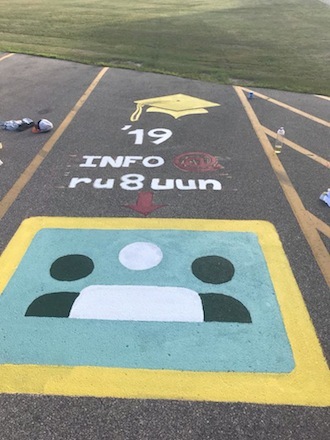 Incoming Westosha Central High School can put a personalized, and artistic touch, on their own parking spaces. The Westosha Central Booster Club spearheaded the idea and looks to use the initiative as a fundraiser, according to club vice president Melissa Kearby. Funds received from the initiative will go towards uniforms, equipment upgrades, and other needed supplies for athletic programs, Kearby said. Kearby, who indicated the Booster Club continues to contribute to athletic programs, said the initiative helps the organization garner needed exposure in the community. “We really wanted to find something that would put us into the school community in a way that gets more recognition as to who were are, what we do, and build a tradition that kids will look forward to,” she said. The kids, meanwhile, will converge onto the parking lot during a senior kickoff day tentatively scheduled for Aug. 25. Students who submit their sketches for approval have the entire day to complete the project. Kearby, who received guidance from other schools in the nation, believes the senior kickoff day will be a blast. Meanwhile, as of July 20, about 32 incoming seniors of the targeted goal of 72 have submitted their sketches through the school’s Google Classroom interface. The initiative is not limited to student-athletes, she said, noting any senior is welcome to add a personalized touch to their parking space. She notes some students have submitted designs, illustrating sports, like volleyball and softball, and hobbies such as hunting and fishing. The Booster Club, meanwhile, came up with the idea after television stations showed students from California and other states in the southern region designing their own spaces. After reaching out to participating schools, the Booster Club received feedback, including paperwork as a guide to the process. “High schools around the nation were participating and students had made YouTube videos showing them painting their spots, so it caught wind on the local news and on social media,” she said. From there, some members of the Booster Club decided to pursue the effort, but needed approval from Westosha Central administrators. School administrators, which had concerns about safety, including snow removal, and reduction of available parking spaces for visitors, requested changes from the initial proposal. “We did that and this past spring, they said that we could give it a try,” Kearby said. Principal Lisa Albrecht expressed initial skepticism, but warmed up to the idea, considering it could foster a positive climate and give students a stronger connection to the school. The Booster Club will accept applications through Aug. 22 for students looking to paint their own parking space. All information is located on Google Classroom.